A terrible thing happens when Jen eats beans. Through the magic of breastfeeding the most common side effect of beans is transferred directly to our babies. They become, fussy, uncomfortable, farting machines. Everyone loses in this equation. 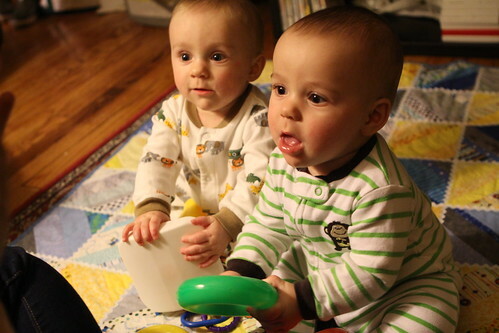 After getting the guys home from daycare I set them up on a quilt to play where they learned the value of sharing. At least for about ten seconds. Then they resorted to every dirty trick in the book to steal toys from each other including techniques such as brute force, sneaky moves, and eye-gouging. Jen mentioned the other night that she would have liked barley with the lamb stew I made. I already had a plan to use polenta as the starch/base so I felt bad I was not able to oblige. I figured I'd try to oblige tonight as temperatures dropped from where they were yesterday in the mid 50s. I also figured to avoid the farting dilemma that I would use good old barley. I decided to make a version of cassoulet. Actually I made it yesterday and cooked if for about eight hours before finally cooling it and saving it for tonight. Purists will argue with me calling it cassoulet as I went a little non-standard with the recipe and decided to substitute barley for the traditional white beans. As far as the stew went I pretty much threw together everything that was leftover in the fridge and freezer: garlic, onion, parsnip, rutabaga, ham, Andouille sausage, duck legs, bacon, pork belly, bay leaf, oregano, rosemary, diced tomato, chicken stock, and a Winter Shredder beer from Cisco Brewery. 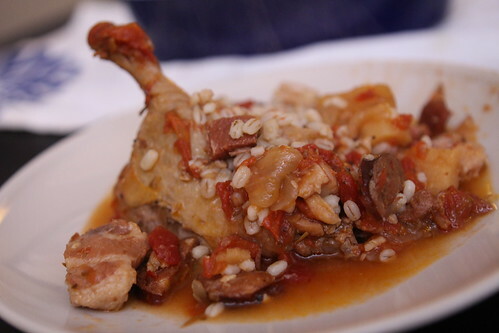 The result with barley was very tasty. I'd highly recommend this option to people trying to avoid beans whether for their own gastrointestinal health or that of their babies. 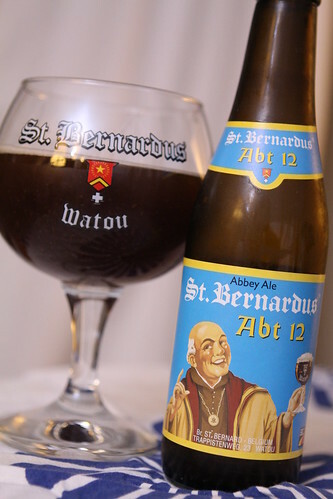 To go with this nice winter stew I opted to crack open another Belgian Quadruple, this time going with Abt 12 from St. Bernardus. This is a beer that most say is comparable to Westvleteren XII. Ever since having the Westvleteren XII I've felt obligated to try more of the style as comparison. It was a bit unfair since I've been aging this one for well over a year so its had a chance to mature a bit in the bottle. The beer aged very well and was right in long with unaged Westvleteren. I suspect the aged Westvleteren may edge it out. I'm looking forward to trying that a year from now. Tonight, after a relatively easy round of getting the Wombats to bed, we are left to lounge about and watch some hockey in the manner of two care-free childless adults. That should all change in a few hours or so.